Smash garlic and add to a saucepan set over medium heat. Add water, vinegar, and sea salt and bring to a boil. In the meantime, slice chili pepper into rings. Add to a sealable glass jar and pour in the garlicky liquid. Tightly seal the jar and let sit at room temperature for at least 2 days before using, then store in the fridge for up to 2 weeks. 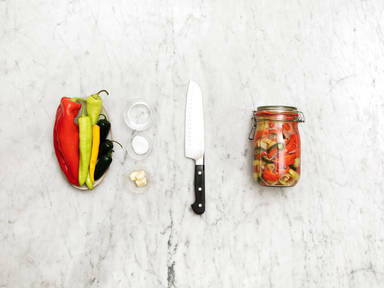 You experiment with different chili peppers, vegetables, or even a variety of vinegars!